Almost two days after terrorists attacked the Indian financial hub of Mumbai, the Indian military is still working to root out the remnants of the assault teams at two hotels and a Jewish center. More than 125 people, including six foreigners, have been killed and 327 more have been wounded. The number is expected to go up, as Indian commandos have recovered an additional 30 dead at the Taj Mahal hotel as fighting has resumed. The Mumbai attack is uniquely different from past terror strikes carried out by Islamic terrorists. Instead of one or more bombings at distinct sites, the Mumbai attackers struck throughout the city using military tactics. Instead of one or more bombings carried out over a short period of time, Mumbai is entering its third day of crisis. While the exact size of the assault force and the support cells is still not known, police estimate about 25 gunmen were involved in the attack. The number of members of the supporting cells that provide financing, training, transportation, and other services could be two to four times this number. Operational security for such a large unit, or grouping of cells, is difficult to maintain and requires organization and discipline. To pull off an attack of this magnitude, it requires months of training, planning, and on-site reconnaissance. Indian officials have stated that the terrorists set up "advance control rooms" at the Taj Mahal and Trident (Oberoi) hotels, and conducted a significant amount of reconnaissance prior to executing the attack. If the news about the "control rooms" is accurate, these rooms may also have served as weapons and ammunition caches for the assault teams to replenish after conducting the first half of the operation. A terrorist outside the train station in Mumbai. 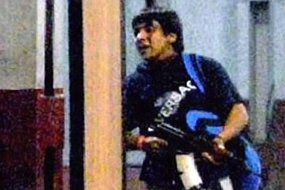 The planners of the Mumbai attack appear to have chosen able military-aged males. Witnesses have described the men as young and fit. Some of the gunmen appear to have been well trained; some have been credited with having good marksmanship and other military skills. A witness who saw one of the teams land by sea described the gunmen as "in their 20s, fair-skinned and tall, clad in jeans and jackets." He saw "eight young men stepping out of the raft, two at a time. They jumped into the waters, and picked up a haversack. They bent down again, and came up carrying two more haversacks, one in each hand." An Indian official claimed the attackers used "sophisticated weapons," however this may be an overstatement. Reports indicate the gunmen used automatic rifles, hand grenades, and some machineguns, as well as several car bombs. The terrorists did not have sophisticated weapons such as anti-aircraft missiles to attack helicopters supporting Indian counterterrorism forces. One of the more intriguing aspects of the attack is how the teams entered Mumbai. Reports indicate at least two of the assault teams arrived from outside the city by sea around 9 p.m. local time. Indian officials believe most if not all of the attackers entered Mumbai via sea. Two ships that have been boarded are strongly suspected of being involved in the attacks: the Kuber, an Indian fishing boat, and the MV Alpha, a Vietnamese cargo ship. Both ships appear to have been directly involved. The Kuber was hijacked on Nov. 13, and its captain was found murdered. Four crewmen are reported to be still missing. Indian security officials found what they believe is evidence linking the boat to the attack, as well as linking the attackers to Pakistan. "A GPS map of south Mumbai was found along with a satellite phone on the ship, Coast Guard officials confirmed," The Times of India reported. "There were reports that this phone was used to make calls to Karachi immediately before the shootings began in Mumbai." Another Indian official said that it is "suspected that the Pakistan Marine Agency helped the terrorists hijack the trawler (the Kuber)," although this has not been confirmed. Another unconfirmed report indicated the Kuber originated from Karachi, Pakistan. From the Colaba police station, the assault force broke up into smaller teams and fanned out to hit secondary targets throughout Mumbai. At least one police van was hijacked and the terrorists drove around the city, firing automatic weapons from the truck at random targets. In all, 10 locations, including the police station, were attacked. The assault teams struck at vital centers where foreigners were likely to congregate: the five-star Taj Mahal and Trident hotels, the Nariman House (an orthodox Jewish center), the Cama hospital, the CSP train station, a cinema, and a cafe were all struck almost simultaneously. Two Taxis were also blown up near the airport in the north and the docks in the southern part of the city. At the Taj, Trident, and Nariman House, several bombs or hand grenades were tossed into the lobbies and in other areas. The Taj Mahal Hotel was set on fire due to the blasts. Gunmen opened fire indiscriminately in the hotel lobbies and at the cafe, cinema, train station, and the Jewish center. At the hotels, gunmen then sought out foreigners holding American, British, and Israeli passports. More than 200 hostages were reported to have been held at the Taj and scores more at the Trident and the Jewish center. Mumbai was under siege as police and counterterrorism officials struggled to regain control of the city. Police appear to have regained control of the situation at the CSP train station, cafe, and cinema relatively quickly, however they were unable to handle the hostage situation at the hotels, the hospital, and the Jewish center. Police officials admitted they were “overwhelmed” by the attacks and unable to contain the fighting. After a delay, more than 200 National Security Guards commandos and a number of elite Naval commandos, as well as an unknown number of Army forces were deployed to Mumbai. The hotels, the hospital, and the Jewish center were surrounded as the special operations forces prepared to assault the buildings. Commandos are in the process of clearing the Taj and the Trident in room-by-room searches. Some of the rooms are reported to have been rigged with explosives. Several National Security Guards commandos have been reported to have been killed or wounded in the fighting. Indian forces are also storming the Jewish Center after air assaulting soldiers into the complex. Curiously, it does not appear the terrorists have executed hostages once they were taken. At this time, police said seven terrorist have been killed and nine have been detained. Several more are still thought to be hiding in the Taj and Trident hotels, and the Jewish center. In an e-mail to local news stations, a group called the Deccan Mujahideen, or Indian Mujahideen, has claimed responsibility for the Mumbai strike. While the Indian Mujahideen’s role in the attack has yet to be confirmed, at least two of the terrorists fighting in Mumbai indicated they were linked to Islamic terrorists. One of the terrorists phoned a news station demanding jihadis be released from jail in exchange for prisoners. "We want all Mujahideens held in India released and only after that we will release the people," a man named Sahadullah told a media outlet. "Release all the Mujahideens, and Muslims living in India should not be troubled." Another terrorist named Imran phoned a TV station and spoke in Urdu in what is believed to be a Kashmiri accent. "Ask the government to talk to us and we will release the hostages," he said. "Are you aware how many people have been killed in Kashmir? Are you aware how your army has killed Muslims? Are you aware how many of them have been killed in Kashmir this week?" The Indian Mujahideen has taken credit for several recent mass-casualty attacks in India. The group claimed credit for the July 25 and 26 bombings in Ahmedabad and Bangalore. At least 36 Indians were killed and more than 120 were wounded in the attacks. The Indian Mujahideen took credit for the Sept. 13 attacks in New Delhi that resulted in 18 killed and more than 90 wounded. The group also claimed credit for the bombings in Jaipur last May (60 killed, more than 200 wounded), and bombings in Uttar Pradesh in November 2007 (14 killed, 50 wounded). In several of those attacks, an Indian Mujahideen operative who calls himself Arbi Hindi e-mailed the media to claim responsibility. Arbi Hindi's real name is Abdul Subhan Qureshi, an Indian national who is believed to be behind many of the recent terror attacks inside India. Qureshi, a computer expert, is believed to have trained hundreds of recruits to conduct terror attacks in India. He is often called India’s Osama bin Laden. Indian intelligence believes the Indian Mujahideen is a front group created by the Lashkar-e-Taiba and the Harkat ul Jihad al Islami. The Indian Mujahideen was created to confuse investigators and cover the tracks of the Students' Islamic Movement of India, or SIMI, a radical Islamist movement, according to Indian intelligence. The Lashkar-e-Taiba and the Harkat ul Jihad al Islami receive support from Pakistan's Inter-Service Intelligence to destabilize India and wage war in Kashmir. Both of these terror groups are local al Qaeda affiliates in Pakistan and conduct attacks in India, Pakistan, and Afghanistan. The Indian “occupation” of Kashmir helped spawn these groups. Reports indicate signals intelligence has linked the attackers back to Pakistan. Intelligence services are said to have intercepted the terrorists' conversations via satellite phone. The men spoke in Punjabi and used Pakistani phrases. Indian politicians have been quick to point the finger at Pakistan. Gujarat state Chief Minister Narendra Modi accused Pakistan of allowing terrorists to use its soil as a terror launchpad. Indian Prime Minister Manmohan Singh blamed terror groups backed by India's "neighbors," a reference to Pakistan. Foreign Minister Pranab Mukherjee said "elements in Pakistan" were behind the Mumbai attacks. The Mumbai attack differs from previous terror attacks launched by Islamic terror groups. Al Qaeda and other terror groups have not used multiple assault teams to attack multiple targets simultaneously in a major city outside of a war zone. Al Qaeda and allied groups have conducted complex military assaults on military and non-military targets in countries such as Iraq, Afghanistan, Chechnya, Somalia, Algeria, and Pakistan. But these are countries that are actively in a state of war or emerging from a recent war, where resources and established fighting units already exist. Al Qaeda has also used the combination of a suicide attack to breach an outer wall followed by one or more assault teams on military bases in Iraq, Afghanistan, and Pakistan, as well as at the US embassy in Yemen. But again, these attacks are focused on a single target, and again occur where the resources and manpower is available. Previous terror attacks in non-war zone countries such as India, London, Spain, the United States, Jordan, Morocco, and Egypt have consisted of suicide or conventional bombings on one or more critical soft targets such as hotels, resorts, cafes, rail stations, trains, and in the case of the Sept. 11 attack, planes used as suicide bombs. The only attack similar to the Mumbai strike is the assault on the Indian Parliament by the Jaish-e-Mohammed, aided by the Lashkar-e-Taiba, in December 2001. A team of Jaish-e-Mohammed fighters attempted to storm the parliament building while in a session was held. A combination of mishaps by the terrorists and the quick reaction of security guards blunted the attack. India has formally demanded strong action from Pakistan against those behind the terror attacks in Mumbai. As Anjana Pasricha reports from New Delhi, the attacks have heightened tensions between the South Asia nuclear-armed rivals after India accused Pakistan-based militants of carrying out the terror strikes. The Indian foreign ministry summoned Pakistan's envoy in New Delhi, Shahid Malik, Monday to inform him that last week's terrorist attacks in Mumbai were carried out by "elements from Pakistan." New Delhi told Pakistan's ambassador that it wants strong action against those responsible. It said Islamabad's "actions need to match the sentiments expressed by its leadership that it wishes to have a qualitatively new relationship with India." Indian officials said the well planned assault was mounted by terrorists trained by the Pakistan-based militant group called Lashkar-e-Taiba. About 10 to 15 heavily armed gunmen attacked different targets across India's business hub last week, killing and wounding hundreds of people. Pakistan has denied any involvement by its state agencies and vowed to cooperate in the investigation. India's junior foreign minister Anand Sharma has called the attacks a setback to the process of normalization of relations between the two countries. "In what I can say was an assault on the dignity of the Indian nation state came from outside India and there are Pakistani links which are very clear and elements from Pakistan and forces and groups from there," he said. The accusations by India have fueled fears of a sharp deterioration in relations between the two countries, and the possibility of heightened tensions along their borders. However, a strategic analyst at New Delhi's Center for Policy Research, Bharat Karnad, said New Delhi is unlikely to do what it did following a deadly assault on its parliament by Pakistan-based militant groups in 2001 when it massed troops along its border, bringing the two countries to the brink of war. "I doubt very much whether this government has the will to get into a punitive mode, and order any kind of military counteraction or something of the kind. That won't happen. But yes relations are in tatters for the moment and that will be the case for a while now," he said. Pakistan has already indicated that if tensions with India escalate, it may move troops from its Afghan border to the Indian border. U.S. Secretary of State, Condoleezza Rice is expected to discuss the terror attacks during a visit to India on Wednesday. India and Pakistan have fought three wars since their independence from Britain. India blames Pakistan-based groups for training and arming Islamic militants to conduct terror strikes in India and to foment a separatist insurgency in Indian Kashmir.